Every couple of years, the National Association of Realtors (NAR) conducts a nationwide survey to identify home buyer and seller statistics, the most recent one from earlier this year. Some of the more interesting stats to our firm include how consumers come to select their real estate agent. Zillow, one of the most visited real estate search sites, also performed a similar study in 2017 which provided additional insight. It’s helpful in our business to monitor and understand consumer behavior. Commissioned sales people are seeking out new clients to represent. Agents who are representing sellers need to know how to effectively get the property in front of buyers. Some highlights of the report are below with some added commentary, as well as a poll. We want to hear from the local readers — where are people finding their real estate agents? 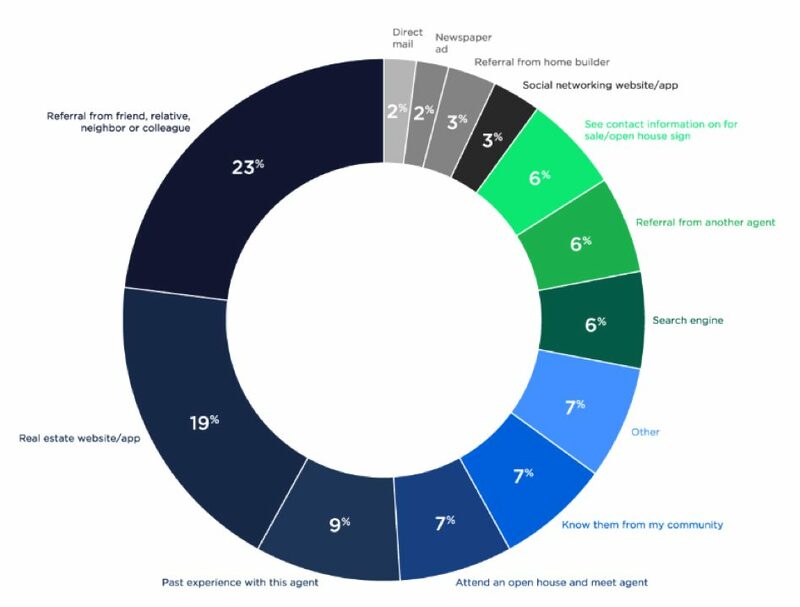 As shown in both the 2017 study as well as the chart from 2018, referrals from a friend, neighbor or relative make up 42% of the source clients use to find their agent. Even if you added the following top 5 sources, it still wouldn’t equate in value, showing just how important (and valid) referrals from friends or relatives can be in the home search process. You can do all the Google searches and Zillow browsing you want, but when it comes to actually selecting an agent you can trust, according to NAR, it always comes back to the direct human element over technology. The final report I want to reference is the 2017 Zillow Group Consumer Housing Trends Report. A biased viewpoint in their data collection is quite possible since admittedly, their main source of revenue is agent advertising. Read it as you will, but whenever a company that has stock in the report they are presenting, I take it with a grain of salt. While yes, friend/relative/neighbor referrals are still #1, their stats drop it down nearly 20% compared to both the 2017 & 2018 NAR Reports. When they present that number, that makes ‘real estate website/app’ the #2 source at 19%, which includes outlets like Zillow. While the pie chart depiction is much more visually appealing than some of NAR’s, we’re not convinced that 1:5 consumers find their agent from a real estate website that sells advertising to agents. In fact, part of the impetus for writing about this is our hunch that fewer people are filling out inquiry/contact forms on Zillow, Realtor.com, or Redfin (all top 5 real estate search sites according to comscore) and that their business model of selling advertising to agents is becoming more difficult. Finally, we want to hear how YOU, the local Popville readers and commenters are finding agents. And of course if you have any good stories about how you found your agent, whether it’s on our list or not, we’d love to hear about your experience in the comments!